During the Great Depression, people who were forced to live in their cars were known as “Ford families.” Today, they go by the far more impersonal name of the “vehicular homeless,” and you can count 45-year-old Carey Fuller and her two daughters, 8 and 17, among them. The Fullers (pictured above) became homeless in April 2004 when Carey lost her job in the financial services sector in Seattle. With the job loss came a move from a three-bedroom apartment into a two-bedroom — but that wasn’t enough to cut expenses. Seeing what was waiting for her around the corner, Fuller took her final bit of income, a tax refund, and used it to buy an RV that she and her girls could live in. After a while, even gas and maintenance on the Winnebago became more than she could afford, so she traded down for a minivan. Fuller takes whatever work she can find, often landing part-time jobs. She also blogs about her life as a homeless mother living in a van. As the economy continues to circle the drain and the number of foreclosures rises, more and more people are following in Fuller’s tracks. Some cities, like Venice and Palo Alto in California, have even created parking areas for people who live in their vehicles. “Cars are the new homeless shelters,” says Joel John Roberts, CEO of PATH (People Assisting the Homeless) Partners, the largest services provider for the homeless in Los Angeles County. Car and van dwellers don’t show up in U.S. Census Bureau data because census workers don’t knock on car windows, Roberts says. How did so many families wind up sleeping in cars, vans and RVs? In most cases, they were hit with a job loss or health crisis that cost them their home. The move from roof to backseat is often swifter than expected, and in the case of those whose homes have been foreclosed, there is often a sense of disbelief that the actual day of eviction will come. Departures are often fast and furious, with things thrown into a van. Often, the newly evicted don’t travel far; they camp out in the neighborhood where they lived. They quickly learn which public parks leave their restrooms unlocked and that joining the local YMCA provides access to a shower. In some cases, it’s divorce, not unemployment, that puts people in their cars at night. Rudy Salinas, director of outreach for PATH, recalls finding a man living in his car in a supermarket parking lot a few months ago. The man had a stack of neatly dry-cleaned uniforms next to him, which he wore to work each day. But at night, separated from his wife and unable to support two households, he slept in the market’s parking lot. Salinas said that PATH did its own census of the homeless population in Hollywood, Calif. They counted 748 people without homes; 151 of them were car dwellers. “In my 19 years of doing outreach, I have never seen such a spike in numbers like the one in the past 18 months,” he says. 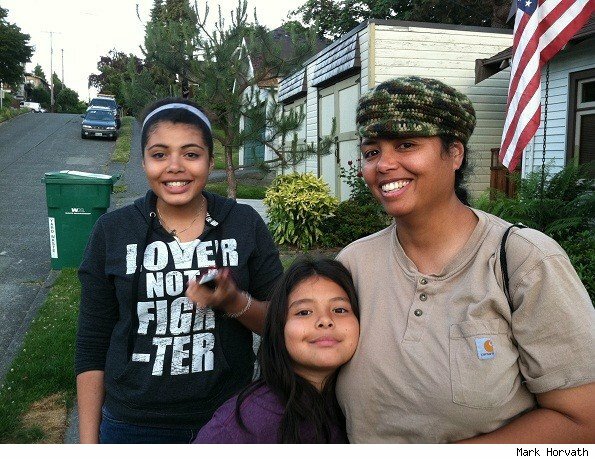 Carey Fuller, the single mother in Seattle, advocates for the homeless while being homeless herself. She says that she parks “anywhere I can” at night, picking spots near foreclosed homes to avoid police detection. Her daughters do their homework in the school library and they do laundry in public laundromats. Meals are taken at church soup kitchens or purchased in convenience marts that have microwaves to heat things up. She lives on an inconsistent child support payment of $150 a month and $500 a month in food stamps for the three of them. Showers are taken at the community pool; on weekends, they hang out at the library where there are many free events. She gave up trying to use the overtaxed housing assistance system, because of the long waiting lists for apartments. Is she just a job away from being able to rent an apartment? Fuller says it isn’t as simple as that. Landlords discriminate against the vehicular homeless, she says, and demand to see a current rental history. After sleeping in the car for nearly eight years, she doesn’t have one. She’s been doing this for so long that it’s become a way of life. Car and van dwellers have formed a community of their own, often exchanging survival tips online. Fuller has taught people how to make a “coffee can cooker” on Facebook. For a long while, the Wal-Mart Stores chain was known for its tacit willingness to let RV-ers use its parking lots overnight. In the evening, the campers served as a de facto security force, making sure that no one did anything to give the police reason to come calling. In the morning, the campers frequented the store, often buying their day’s food and supplies there. Gradually, more and more Walmarts became less hospitable to the community. Word quickly spread among the van dwellers about which ones you could park safely in without getting in trouble. Warm climates tend to draw those living in their vehicles, for the obvious reasons. Southern California, Florida, Arizona and Nevada are popular among the displaced, although many people initially try to stay close to the spot where they fell. They want to keep their kids in the same school, stay close to family and friends. And they lack the money for gas to crisscross the country without direction or purpose. Salinas tells of the single mother who works at a minimum-wage job and has her 5-year-old son sleep in her sister’s Section 8 apartment. She herself sleeps in the car out in front of the apartment each night, fearing that her presence inside would violate her sister’s HUD-landlord agreement, which limits the number of adults allowed. She doesn’t want to cause her sister to become homeless too, Salinas said. It’s not illegal to sleep in your car, by the way, unless a municipality makes it so. As for today’s “Ford families,” it’s not without some irony to give them the moniker. Although Henry Ford did help a small number of distressed families by giving them loans and some land to work, he also laid off thousands more. And he deeply angered many with public comments about how the unemployed should do more to find work for themselves.